I bet lots of you have seen a picture of a covered bridge, and some of you have traveled through one. I'd never encountered one in my native California, and I thought they were pretty much only built in places like Vermont. The sunny afternoon made the inside even darker and more mysterious as the car bumped slowly over the planks. Graffiti marred—or as some would say, decorated—the rough wooden walls. I didn’t peer at it too closely in case obscenities were part of the scrawls. Once through, we could see Beanblossom Creek more clearly, full and rushing from the spring rains. As part of the Summer Giveaway, my author is giving away a signed copy of Death Over Easy to one lucky commenter - and because today is release day, she'll send an audiobook version to another commenter! Be sure to leave your email address in your comment. Readers: Tell me your favorite covered bridge, either one you've been through or seen a picture of. It could also be one you've read about in a book or seen in a movie! Going over a covered bridge was fun but fairly routine when I was growing up. The Jack’ Mountain covered bridge which is still open to traffic, was on the way to friends houses, The Sachs covered bridge, closer to Gettysburg, and historic because of its use by both sides during the battle, was still open for traffic before I became a driver but became a pedestrian traffic only bridge in 1968. Last visited it with Sherry Harris last fall. 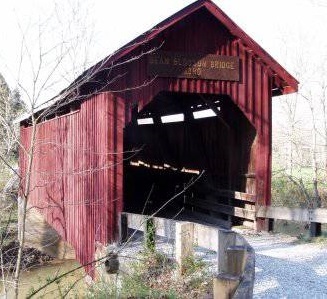 I live in KY, and there are at least 13 covered bridges in the state. Switzer Bridge is the closest and a nice example. I have never seen a covered bridge even though I live in Iowa where the Bridges of Madison County was filmed. Hope to see them this year. If I am lucky enough to win, I would like a print book. Two years ago we took a bucket list trip through the whole state of Maine followed by exploring all the New England states before heading to Niagara Falls. During that trip we saw LOTS of covered bridges. I had to make sure we pulled over and explored them all. I think my favorites were the small old original ones. Lot had been rebuilt. Even thought they were made like the original in every detail they were still "new". I loved the smell of the old wood and how they had worn with use both in old vehicles and with foot traffic. The old ones were usually the ones with the back country feel going over a beautiful stream or pond where you could see the fish jump and things like frogs and butterflies around the native weeds around the edge of the water. Whenever we travel and I see a sign or hear about a covered bridge, we always detour to explore what kind of bridge it is. That's the magic of being retired - the ability to take the detours and see all these amazing sights. About their only competition is the old swinging bridges which we do have in our area. 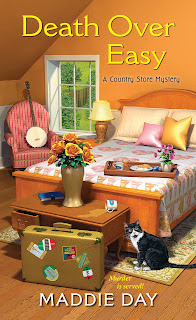 Thank you for the wonderful chance to win a copy of "Death Over Easy"! Love your books and can't wait for the opportunity to read this one. I live in central Pennsylvania, so there are many different covered bridges. My absolute favorite is located in Shermansdale. It is a huge red covered bridge that looks gorgeous drapped in twinkle lights at Christmas. When my sister and I traveled, we went to see the bridges of Madison cty. They were all so beautiful. They will stay in my memories forever. EverEvery fall we spent a weekend in Rockville Indiana at the Covered Bridge Festival. It was wonderful and miss that in AZ. Saw LOTS of covered bridges!!!!! You won the paperback! Please send your mailing address to me at edith@edithmaxwell.com, and congratulations. I can't remember any names but as a kid we drove under covered bridges on vacation. We lived in NW Indiana and made a circuit of Indiana, Illinois, Kentucky and Tennessee. Beautiful country. The bridges seem quaint now but were just a normal part of our trip then. Loved those road trips! Happy release day and thanks for the giveaway. I'm going to have to plan a trip to Cottage Grove, OR. According to their website, they are the "Covered Bridge Capital of the West." There are several in Connecticut that I love. My favorite I think is in Cornwall. There is a covered bridge in Long Grove IL and it was recently restored. It's kind of unexpected to see a covered bridge so close to Chicago. I cannot remember the names, but we used to go to the Covered Bridge Festival when I lived in IN. Those were really nice. Some years back I visited a friend in Portland OR and we travelled around the state photographing covered bridges. There are many in Oregon, the MacKenzie Bridge being one of them. Thanks for a chance to win your giveaway. Babe, you won the audiobook! Please check your email, and congratulations! I have only seen pictures of covered bridges - or in movies. They are lovely. There is actually a covered bridge here in Western Washington state on the WA side of the Columbia River, which divides Washington from Oregon. My husband and I discovered it thanks to a blurb in our AAA guide and we made a point of getting off the highway to see it, photograph it, and drive through it. I was fascinated with the inside of the structure and enjoyed getting out of the van to study the beams and huge bolts of the walls, ceiling, and trusses. It is called the Grays River Covered Bridge and is one of six in our state, but it is the only one still used as a public thoroughfare in our highway system. I've been over many in PA years ago. Love the book - and movie - THE BRIDGES OF MADISON COUNTY. I saw a couple on a road trip to Iowa. Thanks so much for all your lovely comments about covered bridges! OnePonyChick won the paperback and Babe O'Mara the audiobook. Congratulations to both (please check your email), and I'm sorry I don't have a copy of the book for everyone. Remember, you can always request that your library acquire Death Over Easy. And as ever, posting a positive review goes a long way toward helping the author. Actually, OneChickPony, please send your mailing address to me at edith@edithmaxwell.com. Madison county is the only bridge I know about.Went to see it.